The 1945 scheme or 2015 scheme of Academical Dress may be worn by all Western Orthodox University graduates who graduated before 6 February 2015. Those graduating after 6 February 2015 may wear the 2015 scheme only. Details of the Official Robemakers to the University will be supplied to graduates. 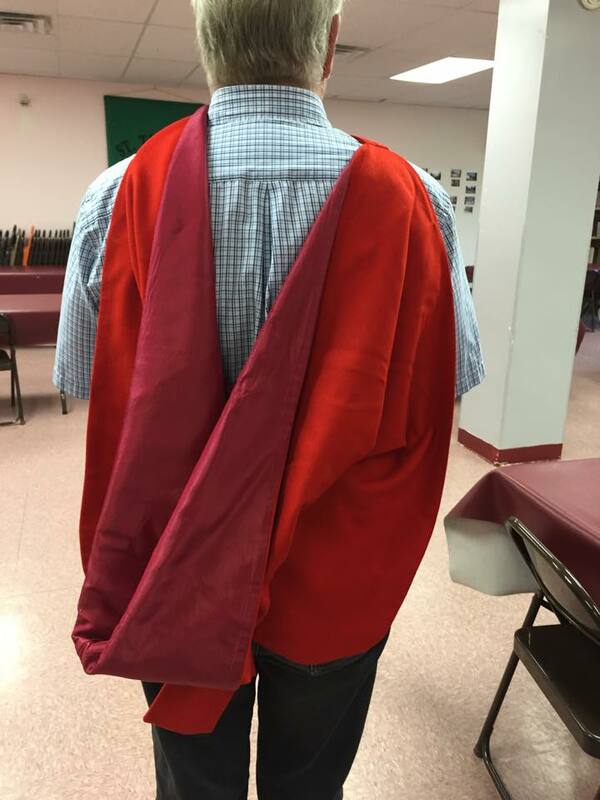 The use of references to hood and gown shapes (“Cambridge M.A. shape” etc.) constitutes a standard referencing scheme in use by academic robemakers, and does not imply any connexion between the University and any other institution. All hoods are lined with ivory Florence brocade, and bordered inside with violet silk in the form of Petersham ribbon. Otherwise, standard fabrics are employed, though it is intended that, where ‘cloth’ is specified, pure wool should be used. Artificial silk or fur may be used in place of natural fibres. All gowns and robes are to be made with curved yokes as used in the University of Oxford. Hood: Oxford doctors’ shape, scarlet cloth, lined ivory brocade, the cowl edge alone bordered inside one inch violet silk, the neckband plain. 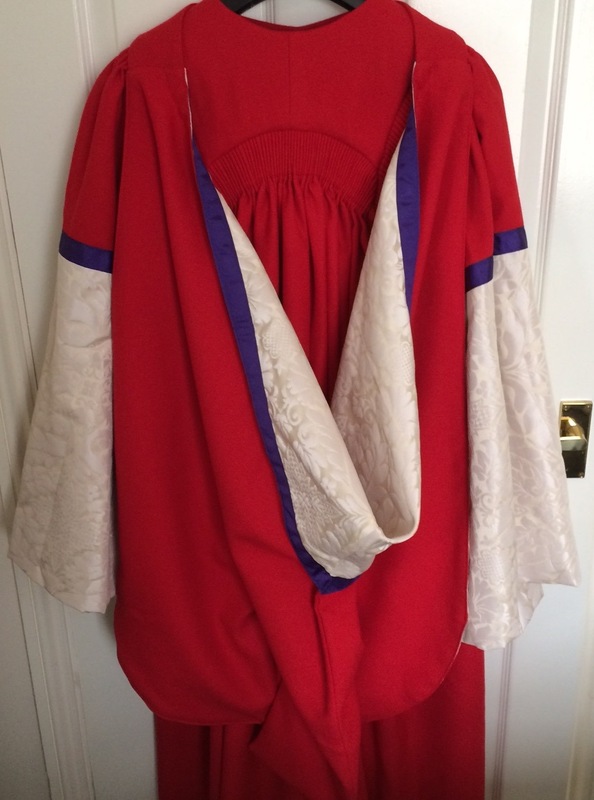 Robe: Oxford doctors’ shape, scarlet cloth, the sleeves and facings covered to the same depth as in the University of Oxford with ivory brocade, the outer edge of the facings bordered one inch with violet silk, one inch of violet silk laid on the sleeves at the point where the brocade meets the scarlet cloth, an ivory cord and button on the yoke. Gown: Cambridge M.A. shape, black silk or stuff, a black cord and button on the yoke. Hood: Cambridge shape, Mary Blue cloth, lined ivory brocade, the cowl edge alone bordered inside one inch violet silk, the neckband plain. Robe: Cambridge M.A. shape, Mary Blue cloth, the facings of the same width as those of the Doctors’ robe (that is, wider than is usual on a gown of Masters’ shape), covered with ivory brocade, the outer edge of the facings bordered one inch violet silk, an ivory cord and button on the yoke. Hood: Oxford doctors’ shape, black corded silk, lined ivory brocade, the cowl edge alone bordered inside one inch violet silk, the neckband plain. Hood: London shape, black corded silk, lined ivory brocade, the cowl edge alone bordered inside one inch violet silk, the neckband plain. Hood: Burgon shape, black corded silk, lined ivory brocade, bordered two inches fur on the cowl edge alone, and one inch violet silk placed inside immediately below the fur. Gown: Oxford B.A. shape, black stuff, with a black cord and button on the yoke. All graduates may wear a black cloth trencher (velvet for Doctors and Fellows). Clergy wearing cassocks under their robes may wear a black cloth Canterbury cap (velvet for Doctors and Fellows). Fr. Tony Clavier wears the University’s Doctor of Divinity hood in the 1945 scheme. Hood: Oxford full shape in scarlet cloth, lined in faculty silk but with a plain scarlet neckband. Hood: Cambridge shape in virgin blue cloth, lined peony red. Hood: London shape in black corded silk, fully lined in faculty silk, the neckband as for bachelors. Hood: Oxford Burgon shape, black corded silk lined dove grey silk, the cowl edged 2 inches white fur and three inches faculty colour, the neckband lined and bound one quarter of an inch faculty. Arts: peony red; Divinity: crimson; Laws: dark blue*; Music: lavender; Science: violet; Natural Philosophy: cerise; Pure Philosophy: green; Letters: old gold; Pedagogy: grey and scarlet; Commerce: grey and pale blue; Social Science: scarlet and black. *D.C.L. : light blue; D.Can.L. : scarlet and powder blue; D.Jur. : scarlet and navy; International Law: scarlet and turquoise. Hoods: Full shape with rounded cape. Purple silk lined gold silk, the cowl edged one inch faculty colour. D.Chr. : black corded; D.D. : black plain; S.T.D. : black watered; D.S.S. : mauve; LL.D. : pale blue; D.C.L. : dark blue; D.Jur. : turquoise; M.D. : scarlet; Mus.D. : cherry; Ph.D.: sage green; D.Phil. : apple green; D.Litt. : crimson; D.Sc. : silver grey; D.Ped. : white; D.Arch. : russet. Hood: Burgon shape, black corded silk, lined crimson silk, bordered two inches ivory brocade on the cowl edge alone. Gown: Oxford B.A. shape, black stuff, with a crimson cord and button on the yoke. Hood: Burgon shape, black corded silk, the cowl faced five inches crimson silk, bordered one inch ivory brocade on the cowl edge alone. Hood: Burgon shape, black corded silk, the cowl faced three inches crimson silk, bordered one inch ivory brocade on the cowl edge alone. A black cloth trencher, or for clergy wearing cassocks, a black cloth Canterbury cap. Postgraduate Diploma in Public Worship: Durham B.A. shape, black corded silk, lined royal blue velvet and bound on all edges 2″ white fur. Associate of Ministry in Public Worship: Durham B.A. shape, black corded silk, lined royal blue velvet. Certificate of Higher Education in Public Worship: Durham B.A. shape, black corded silk, bordered inside 3″ royal blue velvet. Member (E.G.M. ): Durham B.A. shape, black Russell cord, bordered inside the cowl with 1″ royal blue velvet. Postgraduate Diploma in Public Worship: A black stuff gown of Oxford B.A. shape, with the facings covered in royal blue velvet. Member, Certificate of Higher Education, Associate of Ministry in Public Worship: Any black gown of full length.